Party in your mouth Salad – Damn, I Can Make That! I didn’t just title this post “party in your mouth” so that you would click on the recipe. Although that is definitely an added bonus 🙂 I pretty much said exactly that when I first tried this salad at a restaurant. I usually don’t go home and emulate much of what I eat out, but this one was easy & so damn good, it had to be done! Then they added a pinch of dried parsley for color, you can do fresh but make sure its finely chopped & a drizzle of balsamic to top it off. I cant stress how good this is! Going back to my theory on salads being scrumptious and “sultry”. 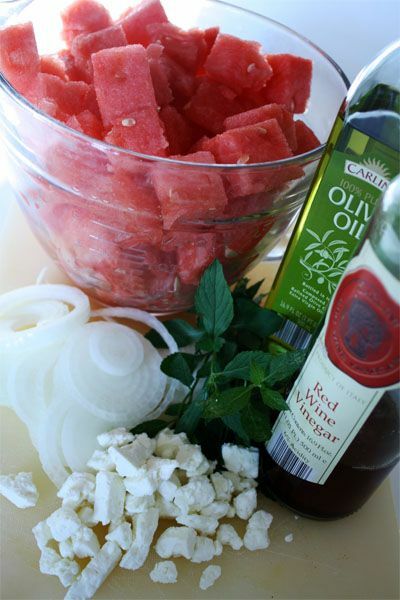 This salad hits all your taste buds: salty (feta), sweet (watermelon), crunchy(onion or cucumber or both), and smooth (balsamic). Now that’s a party! This entry was posted in Appetizing Apps, Sultry Salads and tagged balsamic, cucumber, feta, onion, salad, watermelon. Bookmark the permalink.